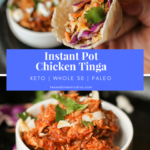 This Paleo Instant Pot chicken tinga solves a classic problem: a family pleasing, healthy meal on the table in a flash! With the new year, so many people are eager to clean up their diets and eat well! 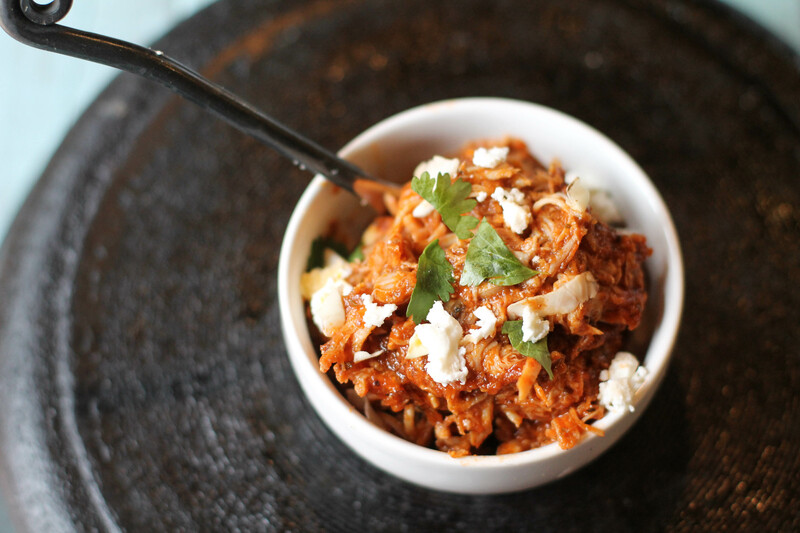 This quick and easy Instant Pot Chicken Tinga recipe means you can still have delicious food that is good for you too! And considering it is Whole 30, Paleo, AND keto compliant, those of you working on your new year’s resolutions have a dinner you can turn to as well! Yay for Paleo Instant Pot recipes! 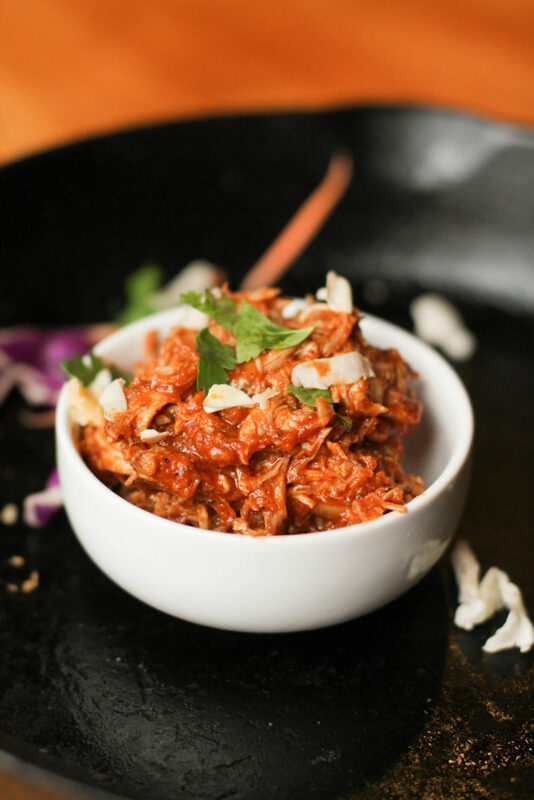 Chicken Tinga or tinga de pollo, is a traditional Mexican dish of tender shredded chicken bathed in a tomato-chipotle sauce! There are many versions out there, most quite fiery. But I knew I would not get away with fiery in this household, oh no!! Around this house, Mexican food is king. It is liked by every member of the household, and I have no problem adapting it to be lower carb for me! So to recap…..kids don’t complain and they eat their whole dinner. Check. Double check. I like to keep taco nights interesting by changing up the flavors of the meat, which is how this recipe was born. Not that my kids need anything interesting. Oh no. Serve the same 2 or three meals with minimal flavors and they’re good to go!! Who needs variety and flavor (me!)?!! By the way…the food experts who say that all you have to do is model healthy eating and your kids will follow suit……yeah, not so much. I think one day, maybe….they might look back and fondly remember and long for mom’s food in all of it’s variety and glory and might willingly…no…maybe actually ENJOY a stray vegetable or two!? But for now, I wanted to keep it super simple for busy families (yay for blenders and Instant Pots! ), and mild enough for the (usually) less adventurous kid pallets. 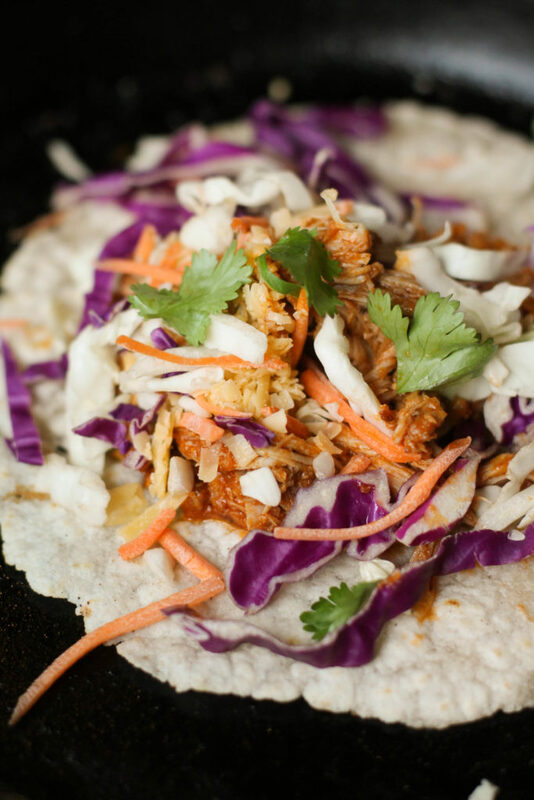 SERVING SUGGESTIONS – Once this flavorful Instant Pot chicken tinga is made, what you choose to DO with it is up to you (idea overload coming you way!)!. Serve atop a bed of greens with all the fixings for a taco salad. We love my spicy slaw too. Serve inside any tortilla as taco…with all the fixings too of course (or some of the above mentioned slaw!!) I make these Cassava Flour Tortillas from the Urban Poser which rock! As a burrito bowl on a bed of rice and beans…….with…..you guessed it!! All the fixings (again!) And if you like beans, I have a bomber recipe for THE best darn pot of beans you’ll ever make that you should check out! I even thought making some sort of empañada inside my favorite Paleo Pie Crust would be amazing too! How about on top of a bed of freshly sauteed cauli rice (don’t forget the fixings!!)? See. I told you that was a lot of ideas! NO INSTANT POT, NO WORRIES!! If you do NOT have an Instant Pot yet, no biggy! You can modify this for the stove or Crock Pot easily. Brown the thighs as directed than pour the sauce over the top. Bring to a simmer, cover, and simmer for 30-45 minutes until the chicken is fall apart tender (or in your crockpot on high for a few hours). Watch the liquid, and if it gets too dry, add some water. More Family Friendly Instant Pot Ideas? I have loads of recipes perfect for a Whole 30 (or easily adapted to be so). Check out all my recipes with the Whole 30 tag!! 14 ounce can tomatoes stewed, diced, whatever! shredded cabbage chopped cilantro (could be blended into the sauce too), onion, avocado, pickled jalapeño, tomato, cotija or feta (IF ALLOWED), hot sauce. Preheat you Instant Pot on the 'saute' feature. Salt and pepper your thighs, then place in a single layer in the pot to brown, do not overcrowd. Leave alone for 3-5 minutes to really crisp up and brown the sides, then flip and brown the other. Meanwhile, place all the remaining ingredients into your blender and puree. When thighs are done browning, place the remaining thighs right in over the top (could elect to brown all thighs in a few batches, but I just wanted to develop the flavor a bit and bypassed browning all of them). and pour the pureed sauce over the top. Lock on your lid, set your manual setting to 12 minutes. When it is complete, turn Instant Pot off, and natural release. Remove thighs and set aside to shred. With the remaining sauce, use the 'saute' feature to reduce the liquid by at least half. While the sauce reduces, shred the chicken with two forks or your fingers. Toss the chicken with the reduced sauce. Ready to serve in any style tacos, nachos, or atop a taco salad! How many oz/cups do you recommend a serving size! I love this Instant Pot recipe! So flavorful & good! Maybe it was me but I didn’t have enough flavor with this recipe. Mine turned out pretty tomato strong. Chipotle is my LOVE language! I have never had chicken tinga though! I can’t wait to try this! Some lofty praise indeed Lauren!!! So happy you all enjoyed it so much! This is soooo good in case anyone is looking for a review of someone who has tried it!! Love it! Crock pot works too. Glad to know the crockpot is works too!! Thanks Kirsten! Mexican food is always a win in my book! I love the idea of serving the chicken with cassava flour tortillas!! We love the unique flavor chipotle pepper in adobo sauce — this recipe sounds wonderful! I can see folding the chicken into a lettuce wrap or even layering it in enchiladas. YUM! Oh yes, lettuce wrap style IS delicious Judy!! This is exactly the kind of recipe I need for meal planning when I”m doing a big batch cook for the week. This looks fantastic! Yes, it lends itself well to large batch cooking leslie!! 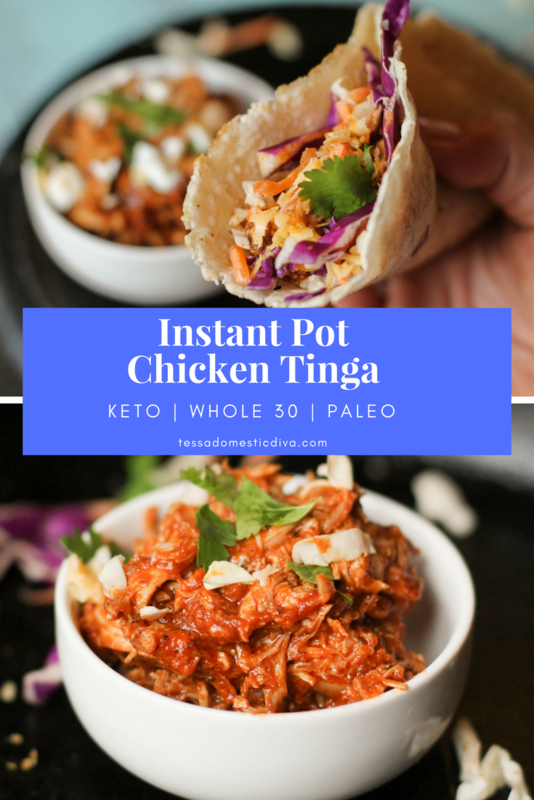 I had never heard of chicken tinga and then I read “bathed in tomato chipotle sauce”… um and I’m in! This sounds so delicious! Instant pot must be the most wanted kitchen appliance in US last year for Christmas ! Beautiful recipe and pretty photography! Swoon! This looks so good! Love all of that saucy goodness and that you made it in the Instant Pot. So yummy on the cassava flour tortillas too. YUM! My husband loves Mexican foods. Well, in Canada, we don’t get to eat a lot of it. So I would love to try this recipe for him, in my new Instant Pot. All the serving suggestions sound wonderful! You totally made me laugh with your stories of the kids. Mine are the same, eating the same few favourite foods and sometimes plain foods. But can’t complain, at least there are a handful of vegetable dishes they would eat, as long as cooked by me (making me tired and proud at the same time, haha). We eat Mexican food ALL the time, and have really great restaurants nearby. I spent a lot of time in Mexico, so I am super picky about it! Of course, my versions are much cleaner than the stuff in restaurants! I would take a handful of vegetables at this point!! One does like nori at least! Love the simplicity yet still, the recipe has bold flavors! And I bet that chicken is super tender! I am definitely putting this on my menu for next week. Not only is it a dish that my husband and I can eat on Keto, but also one my two sons who are not keto would love too! Yep…..here too! I am the only keto one! I’ve never had chicken tinga, but chipotle anything is my love language! This looks great! well, it IS chipotle afterall Renee! Looks so flavorful! I love that you can make this in the IP. Pinning to try later! LOVE. LOVE. LOVE. So pretty and easy…and obviously delicious! OMG! When I think of a hearty and filling meal, this is the type of food I want. Can’t wait to try this! Awesome photos btw! This is an outstanding dish! Easy to make and so delicious! It’s a new Mexican dish I will keep and use as a go to instead of seasoned hamburger . Great Susan! It’s so quick and easy, a nice change of pace when you want something different!